Well, against my better judgment I finally saw Suicide Squad over the holiday break, and let me tell you I shouldn't have. That miserable vomitous mass is an insult to the very idea of movies as a pleasant enterprise. It's 2 hours of trash. No, really, I mean actual, literal trash, as one of the major plot points - I kid you not - involves a swirling tower of flying rubbish propelled by the sorcery of a shimmying witch wearing a skimpy, spangled Las Vegas showgirl outfit. The whole thing is as silly as it sounds. I watched Suicide Squad with Alessandra. I suppose I should clarify and say that we hate-watched it. We knew it would stink like a heap of dead sewer rats - New York City-sized ones at that - but even we connoisseurs of crap entertainment were frankly astonished by the sheer incompetence we saw on screen. The basic premise - getting a bunch of convicted, imprisoned criminals to carry out dangerous government missions - isn't bad in itself, but the execution was shockingly shoddy. From an entire phalanx of characters we don't care about at all to a plot that - as Alessandra said - isn't even a plot, so much is wrong with the movie that my head is spinning. In fact, let me make it easier on us all. 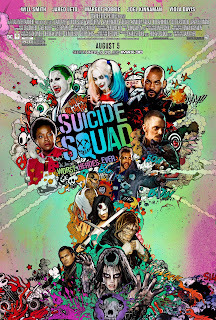 There are 2 - and only 2 - good things about this movie, and they are Will Smith as Deadshot and Margot Robbie as Harley Quinn (though her exaggerated accent started to grate as time went on). Everybody and everything else is a complete failure. Of those crashing ruins, Jared Leto's Joker just might be the worst offender of all. The less said about him, the better. He is to this movie what Jesse Eisenberg's Luthor was to Batman v. Superman. What the hell is wrong with DC Comics? No, wait, don't answer that. I haven't got the time or the inclination for a dissertation, though I suspect that a big part of it can be summed up in 2 words: Zack Snyder, the Michael Bay of comic book movies. Mad Minerva gives Suicide Squad a grade of D- because it's somehow even worse than Batman v Superman: Dawn of Justice, a movie that I savaged. 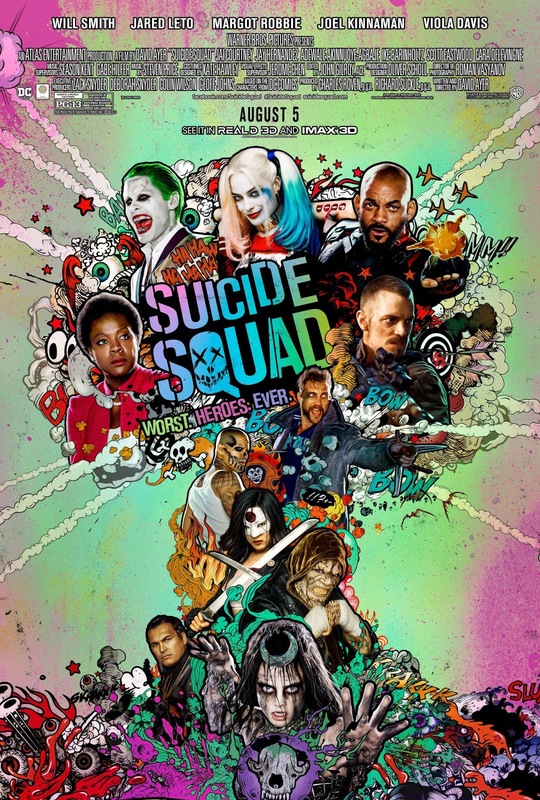 RottenTomatoes gives Suicide Squad the miserable Rotten rating of 26%. Suicide Squad runs 123 minutes and is rated PG-13 for violence, some language, suggestive content, and total narrative idiocy. Concluding Thought 1: I have to say too: I am now completely pessimistic about this summer's Wonder Woman movie. DC is going to screw it up. They're going to screw up one of the best comic book characters in existence. Concluding Thought 2: Go watch 1967's The Dirty Dozen instead. That film's a classic, and the cast is full of stars. US-UK Special Relationship Back On?